When you let a strong woman go, you aren’t doing yourself a favor. You’re doing her a favor. Because a strong woman knows that she is worth more than a guy who will let her go. A strong woman knows that she is the best thing that ever happened to you. And you won’t find it again. A strong woman will never let a silly boy destroy her. No, she will rise over and over again. Because no matter how many times she gets brought down, she won’t be down for too long. A strong woman will get heartbroken. But when she does, she will let herself grieve. And let herself feel. She won’t pretend everything’s ok and flash fake smiles for anyone to see. She will heal. And then once she is ready, she won’t dwell on the past. She won’t dwell on the boy who cracked her. She won’t shed anymore tears on the boy who was too dumb to realize what he lost. 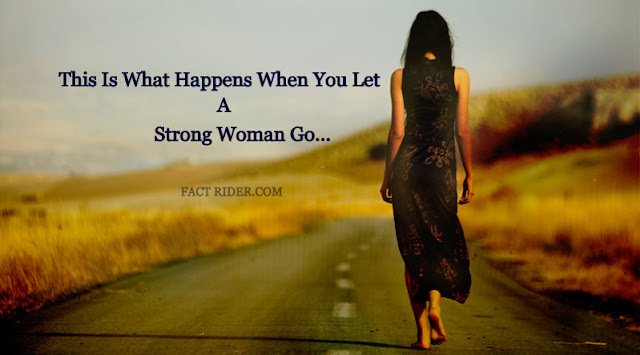 So, when you let a strong woman go, you are actually setting her free. You see, she doesn’t need a man for survival. And she most definitely does not need a dishonest, selfish boy who only thinks of himself. She trusts in her heart that one day she will find the person who will realize her worth. And who will realize that she is his sun, earth and sky. And don’t be confused. She’s not going to beg for you back. She’s not going to ring your doorbell a hundred times to get your attention. She’s not going to try super hard to look good when she knows you’ll be at the same party as her. Hah, she isn’t going to give a damn about what you think of her now. So, next time you see her laughing with her friends and flashing that beautiful smile, know that it isn’t a mistake. She isn’t faking it.She’s actually happy. Without. You. Please get it in your little head. You let her go. And now, she’s better off for it. Don’t think she will ever go running back to you like a puppy. Don’t fantasize about her calling you up on a Thursday night in tears because she misses you. And don’t you dare think that she is going to plead for you back. Little boy, she has more heart than you will ever have. She is more beautiful than you will ever be.And she is her own damn sun, moon, star, and sky.